This is one in a series of classic slots (or fruit machines, if you live int he UK) that have been upgraded for modern playing. 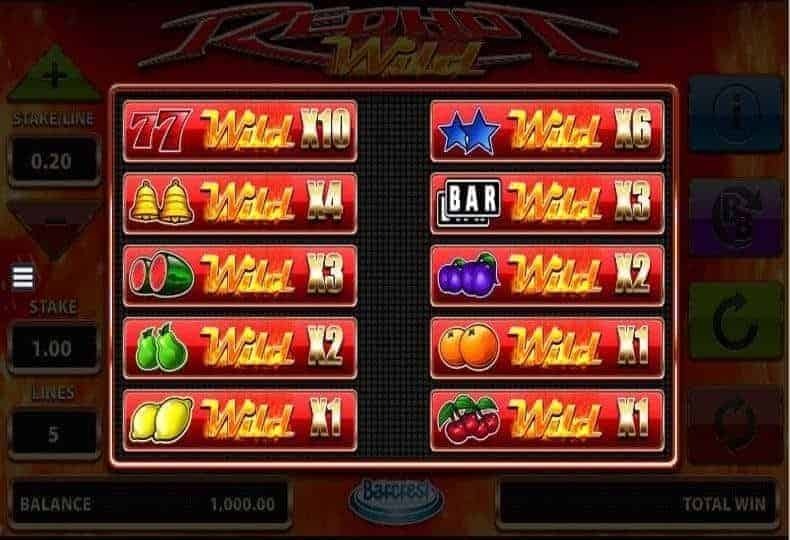 The Red Hot Wild slot game features 3 reels and lots of fruit symbols (plums, lemons etc) that are rarely seen in Las Vegas, but are standard symbols all over Europe, including the UK. Red Hot Wild is a classic, 3-reel, 5-pay-line slot machine, with a modern twist, that is manifested in an array of options and rewarding enhancements which are available to players. Powered by Barcrest, the game is themed around fire, with the flaming backdrop and suitable sound-effects that add to the fiery atmosphere, creating the overall excitement. The symbols populating the reels include traditional fruit items, such as cherries, watermelons, lemons, pears, oranges, and plums. In addition, you will come across bells, lucky 7s, bars, and blue stars that make up the higher value symbols on the reels. The Red Hot Wild slot doesn't include the traditional free spins, or any other Bonus game that punters may already be familiar with. Nonetheless, the seeming shortcoming is compensated with the innovative Big Bet feature that provides players with an opportunity to select the icon which will be turned into Wild, as well as to choose the multiplier, ranging between 1x and 10x, that will be attached to that icon. However, keep in mind that the bigger the multiplier you select, the less frequently the symbol will land on the reels. The Big Bet can be purchased for either $20 or $30, and both of these values provide different extras, to improve the odds of winning big. For instance, the $20 wager will award five spins where any Wild symbol that lands will become a stepping Wild, meaning that it will remain locked in its place for the next spin, and, also, stepping one space down. The $30 wager will provide you with five successive spins where all instances of Wilds will turn into sticky Wilds, and stay in their positions for the duration of the spins. The potential maximum win in Red Hot Wild slots is 8,333x the total bet, awarded if you manage to cover all reels with Wild symbols on the very first spin. The Aristocrat title is a true representative of the old-school fruit machines that most UK punters will be delighted to come across, as well as a genuine version of an exciting online pokie that will fit the needs of bettors from New Zealand and Australia. The newly updated game has much better sound and graphics than the old style 3 reels slots and also offers a 'Big Bet' feature. In another twist, the Red Hot Wild slot does not have classic wild symbols, but you can pick out which symbols you would like to act as the wild one. So for example, you could have wild plums! In the Big Bet feature, you get free spins with either Stepping Wilds or Locking Wilds. It's expensive to play the big bet, but massively exciting. The great thin is, with our free game, you can play the Big Bet without worrying about losing any cash - you can play this game for free all day and it won't cost a penny. No download, no registration required, just pure and simple free slots fun.